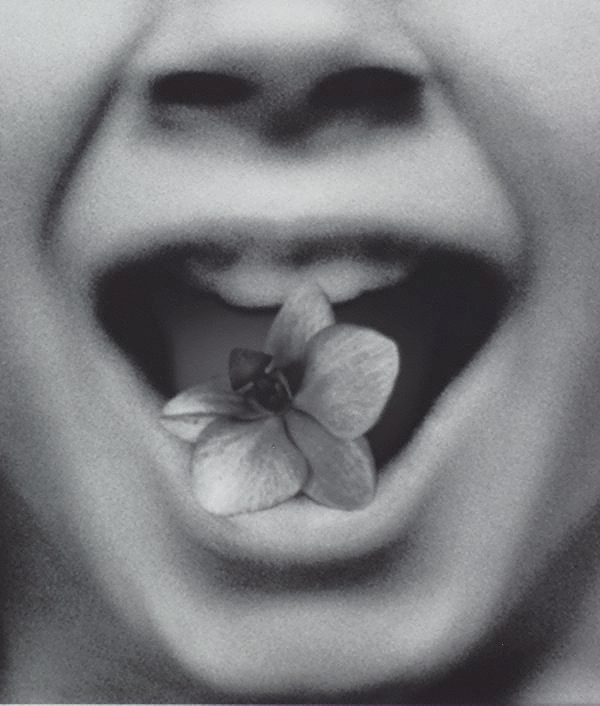 According to Australian writer Edward Colless, when confronted with Pat Brassington’s photographs, ‘we are directed to squirm yet savour their cruel eccentricities, to command this connoisseurship of the creepy… its sinister playful surfeit of spectral horror.’ 1 With their warped perspective and forms, achieved through digital manipulation, Brassington’s photographs articulate an aesthetic of distortion. ‘The permissions’ perpetuate Brassington's signature mode of domestic unease. The six photographs feature metaphoric motifs that reoccur throughout Brassington’s oeuvre including partially obscured faces, mouths, and tense, clasped hands and mark a return to a monochromatic palette. Since the late 1990s Brassington has used colour as a metaphoric device, using tones that evoke shades of human flesh. Drained of colour, ‘The permissions’ project a different sense of the corporeal. The body is still present yet seems more indeterminate. ‘The permissions #1’ depicts what looks to be the lower half of a human palm against a tangle of contorted fabric. While recognizably human, the form is ambiguous. Its peculiar texture does not resemble skin but the surface of stretched nylon. ‘The permissions #3’ reveals what could be stiff fingers grasping what might pass for an elbow or a knee, or something else altogether. There is one small patch of colour in this sequence of black and white photographs. The eye of the toy rabbit in ‘The permissions #4’ is blood red. This eye, along with the strange knot of white hair also protruding from the linen sheets, delivers a sinister edge. Such elements expose the eeriness Brassington courts, while also indulging a Lewis Carroll-esque humor. Furthermore, the close cropping and distorted camera angles of these works disturb the legibility of the objects/forms depicted. The relationship between each photograph in the group is also obfuscated. There is no invitation to decipher the narrative links between images or decode their allegorical resonance; they do not operate as the sequential components of a storyboard. Rather, the photographs hang together as a series of self-contained image fragments, indeterminate metaphors or untethered dream stills.